Where’s the ‘Mano‘ come in? The phrase ‘mano a mano’ has several interpretations. I’ve heard it commonly used to mean going at someone (literally or figuratively), for example a fistfight or boxing match. Sometimes I feel as if I’m boxing with the pattern, and the pattern is winning! On the plus side, I’ve progressed ‘some‘ with shading the tiles – at least with my confidence in shading them – and I’ve accepted that I’m not going to make mistake-free tangles. Hugely freeing! I felt more relaxed and less judgmental with this series than with previous practice, and I’ve gotten over my reluctance to post them. After all, my blog is partly a legacy to Sparks and Raqi who will have many questions years from now about who Mima and Papa were when we weren’t in grandparent mode. If I leave footprints of our lives, they won’t have as many unanswered questions as I do about my long-gone grandparents. These first two tangles are variations on Hi-C. The first one is Hi-C done once in the entire tile, and the second is a quarter of Hi-C tangled repeatedly. This is one of my favorite patterns to draw. I’ll probably forget and post subsequent Hi-C’s! The next one is called Umble. It’s my first attempt, and I like it enough that I’ll record the step-outs in my Tangle Journal. Step-outs are the sequential drawing steps provided by the Tangler who designed and named the tangle. Following are three new-to-me patterns, and one I’ve used but not as a monotangle. I’m frustrated with both the brown paper and brown Micron pens. The pages of the Strathmore Toned Tan journal have an almost slick finish, making it difficult for the ink to ‘grab’. 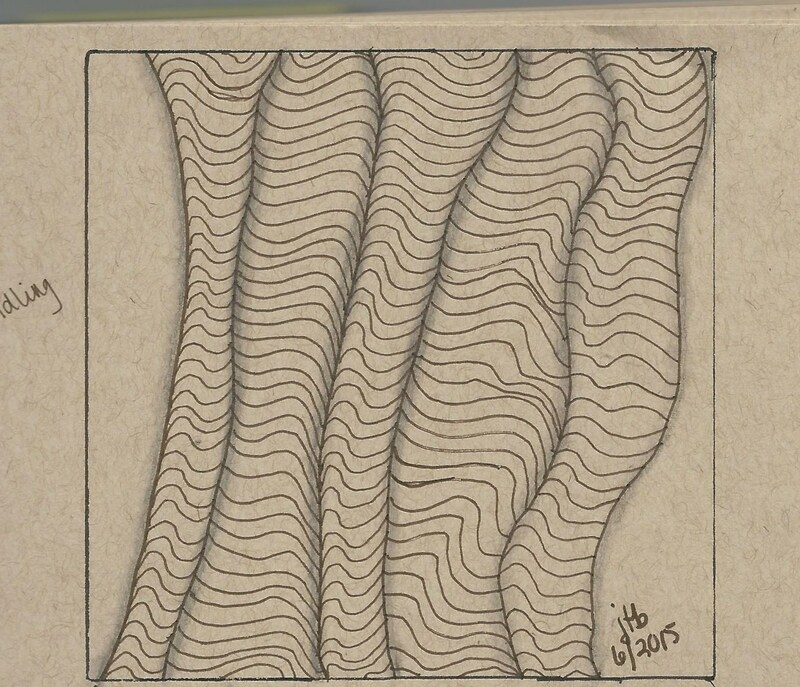 I don’t think the official Zentangle tan tiles are significantly more user-friendly, and they are quite expensive compared to journals. The brown pens kept drying out as they touched the paper, making Ixorus especially hard to draw. I returned to black ink for the others. 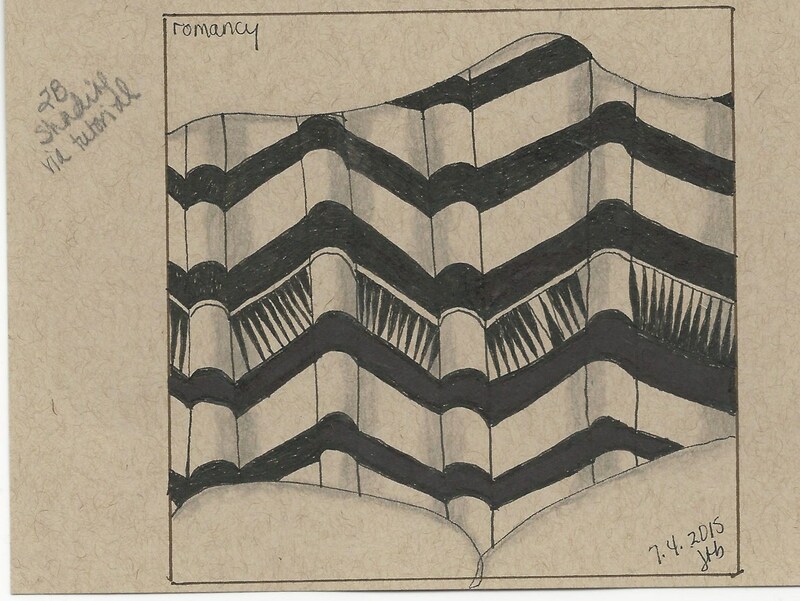 Romancy – the tangle below is my favorite in this series because the Tangler designed this from the black and white Moors-originated columns she saw in European cathedrals. Hub and I were quite taken with the variations and history of cathedral columns, and my heart always quickens with good memories when I see a photo that includes columns I can now identify. 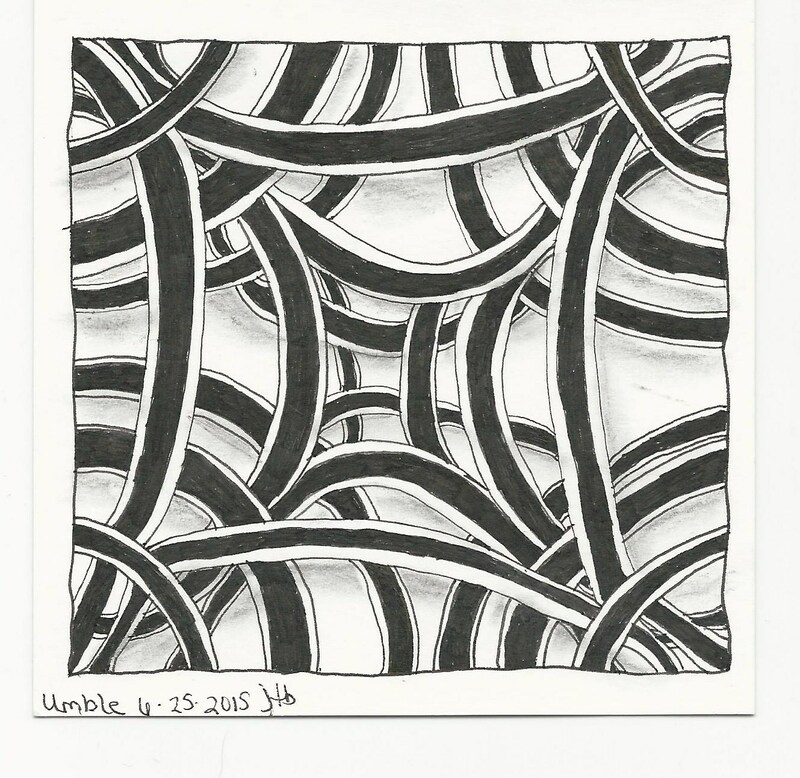 This tangle provides an opportunity for many variations as well as practice with shading and dimension. I’ll be using this one again! JayBarz is a recently introduced tangle. It was a lot of fun to create. I’ll be trying more variations with this. I like Umble best – it has a 3D quality. Thanks, Maggie. That’s the hardest for me – achieving 3D. Practice, practice, practice! These are amazing, and mind boggling. Wow! My boss at PM kept stressing that he wanted us to use different colors in our workpapers – who had time for that? Besides, if I had multiple color pens, my workpapers would have looked like something out of the 60s. Thanks! You really are getting quite good at these! I too like the 3-D ones the best (although I also love the intricacies of the others). Thanks for sharing! Thank you, Janis. I ‘box’ most against the complexities of 3D-ism (because I still don’t understand what the explanations of light, shadows, etc.) But I finally found a Tangler video on shading where she said shading doesn’t have to be about light and shadows; it can be about what YOU want to highlight or make stand out. For some reason, her personality was so low-key, and her examples so simplistic that I was able to take the pressure off myself. It’s why research is so critical in learning something new and intimidating – one ‘teacher/mentor’ might not get through but if you keep searching, someone eventually will give you an insight. Thank you, Lainey! I hoped it would appear that way and I will definitely be practicing that one with more variations. These are gorgeous! Sometimes doing a monotangle is the way to go – I’m currently working on a fairly large (by Zentangle standards) piece that will be entirely made up of one repeated tangle over a watercolour wash, and it’s surprisingly effective! Thanks for introducing me to some new tangles – I hadn’t seen either Romancy or JayBarz, and I love them both. I’ll have to seek them out and give them a try! I will look up the tangler URL for those two tangle step-outs and send it to you. 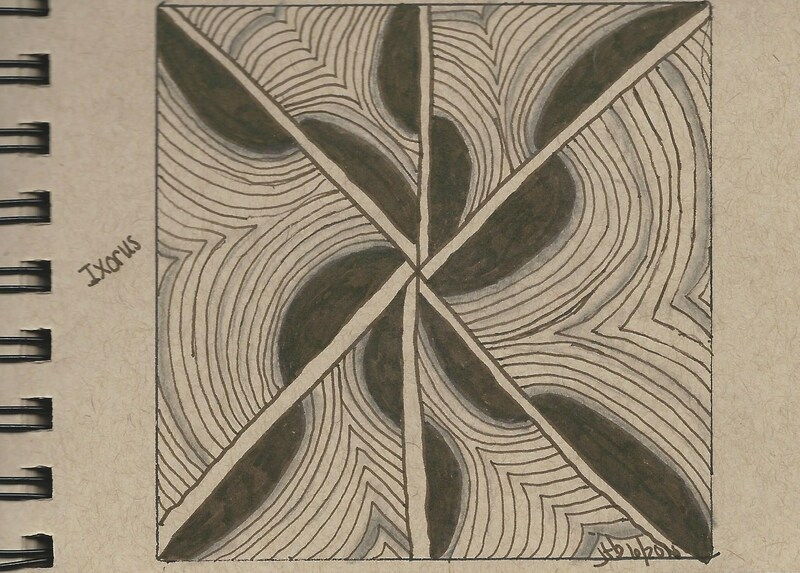 They aren’t on Zentangle because they aren’t designs of Rick or Maria’s. Thank you so much! I’m not sure whether it’ll be finished in time for tomorrow’s Tangled Tuesday post, but I will definitely share some WIP photos if it’s not. And thank you in advance for the links! That’d be great! I commented on your gratitude post with a link. These are wonderful and they seem like they’d be very satisfying to create. But I worry if I’d try them, I’d strain my already taxed vision and end up needing a new prescription for contacts and glasses! Thanks, Carrie. I know – that’s why I’m in a frenzy to do them now because i have high probability of wet macular degeneration in my future. I figure I can paint big watercolor washes at that point, but detail stuff needs to be done now. I have to take my glasses off for this close work and be VERY mindful of neck/shoulder positions with frequent breaks. My optometrist says I’m not damaging my eyesight by doing close work without glasses but who knows? Always looking for magnification tools but nothing satisfactory yet – just lots of good light. Thank you. It’s a writing conference, so it should be fun. Lots of big-name authors there, and I’m already looking forward to getting some books signed. And my news is book-related too. Woo hoo! Like you, I have to slip my glasses off to do really close work. If my contacts are on, I have to slip on reading glasses. What a mess I am. Is it very windy there then? I have heard that Chicago is the windy city. Chicago IS !!! Those wintry blasts off of Lake Michigan are bone-chilling. We rarely use umbrellas – winds make their use impractical. Well that’s OK because I don’t wear hats (unless it is a heatwave) and I wouldn’t be seen dead in a fascinator! OH take note! I love the Romancy. Okay, I love them all, but that one especially! Food for thought, but when you undling, undulating, whatever, try going from right to left. My mother (the draftsman) says our sense of level is better that way, and I’ve found she’s right in my case. I got a new mandala book, and I love coloring, but I can’t imagine creating the tangles — I love seeing your work! Keep sharing! 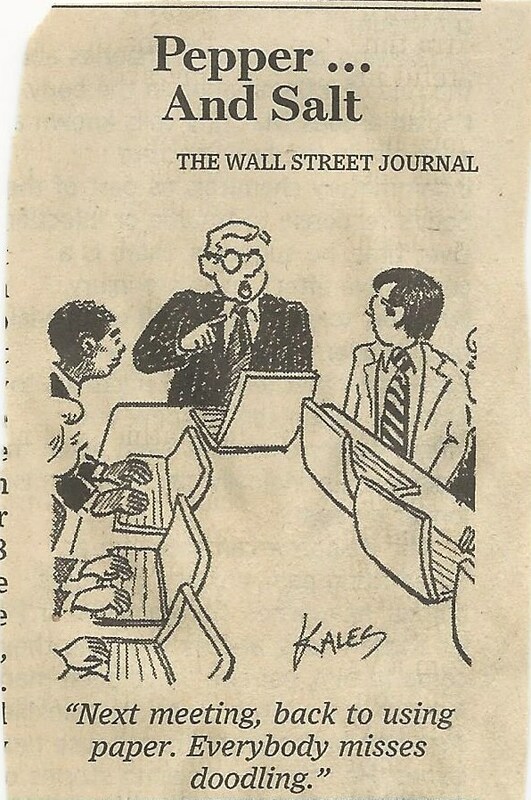 It’s great that you suggested right to left – I wonder how long it would have taken me to think of that! I’ve had one of those ‘eternal’ draft posts about the ways I try to use the opposite hand to do things, and I try writing with my left hand, but tangling right to left with my dominant hand never occurred to me. That will be a whole new experience and one I will try ‘tout de suite’!! Thanks again – i love what I learn from y’all. Different strokes, Babe 😀. What do you use? I like colored pencils but the results are too blah for me. I look forward to your photo(s). Colored pencils have to be the expensive sort, the vivid color — but those smear so easily, they’re not good for tiny spaces. Oooo . . . I have so much catching up to do. I’m new to blogging and now new to tangling as well. They’re all beautiful to me. Looks like something I’d love to try! Carol – like you, I stumbled onto tangling on a blogger’s site soon after I began blogging. I couldn’t take my eyes off her art! May I introduce you to lovely Laurel who blogs at http://alphabetsalad.com. She was my early inspiration, steadfast supporter and, in many ways, mentor. You will enjoy her site. I also follow http://tangledinkart.blogspot.com and she is the designer of the JayBarz tangle. 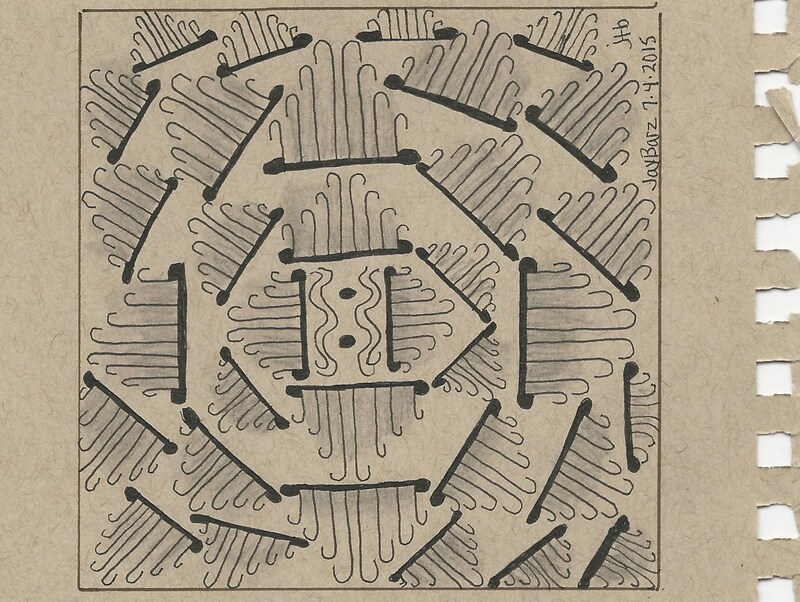 The official Zentangle site is http://zentangle.com. I am in awe…I never even learned to color within the lines. These are amazing! Thank you, Curt 😀 these are quite addicting. If you like my amateurish attempts, google zentangles and see the truly awesome creations. Thank you Joanne. You have the bones; they might just be creaky ‘cuz they haven’t been oiled. Wow, I like them all, although that first Hi-C image has a spiraling quality to it that pulls me in. I love it that you do this partially to leave footprints of lives for future generation, and admire your patience. That is a wonderful talent, so very artistic. I just looked at Ixorus again and find I like that one very much, too. Thanks, Silvia for your support. I’m so grateful for the positive ways we encourage each other in the blogging community. The mentoring, sharing of techniques and resources, and genuine delight we take in each others’ endeavors is what makes me want to keep striving. We might not understand each other’s genres or art styles, but we do understand the insecurities, frustrations and doubts because those are prevalent for all of us. And the appreciation for effort is what resonates. So very true, Sammy. Artistic minds understand one another well. No artist can do it alone. I am immensely grateful to have found people like you in the blogosphere. I took a workshop in Zentangles last year. It was challenging but fun! Our last class we decorated martini glasses. The instructor called them “zentini glasses” – cute! I agree with you about making mistakes – at first I didn’t want to mess up, but then I realized it kind of adds to the character of the piece. I can’t believe you took a workshop – how come you’re not flashing me some of your art?!? I’ve seen the beautiful pieces on quite a few blogsites, especially from women who have attended the seminars. Their work is amazing!! I’m just a chicken-scratcher but I do love doing it. OK. Full disclosure – the lady who gave the workshops was not an “official” instructor. I think she was hoping to become one and was using us for practice. I made quite a few pieces I liked…but they are nowhere near as detailed as some of yours. Where did you learn your designs? I am enjoying my re-acquaintance with coloring books. 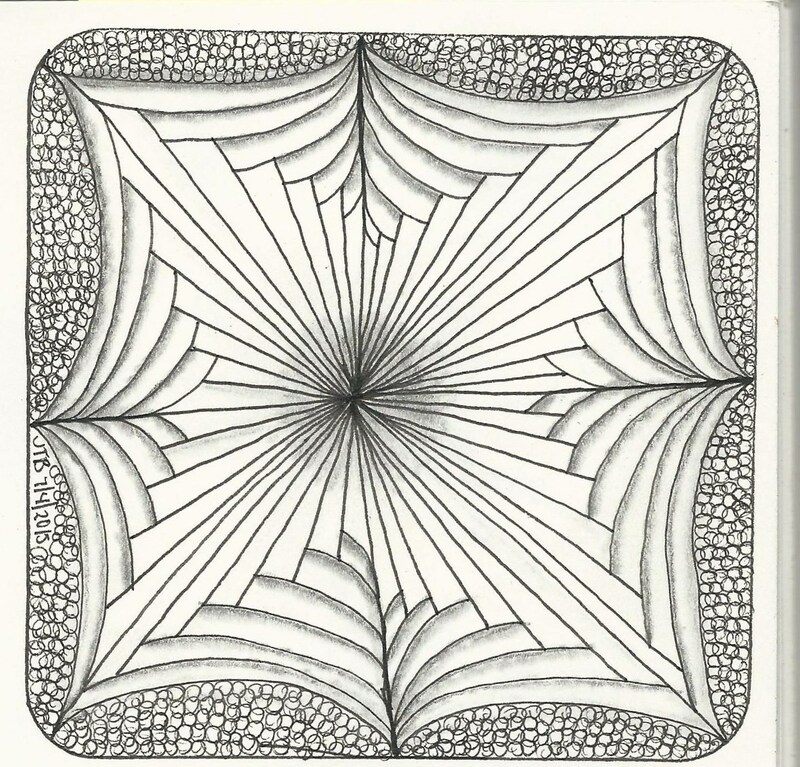 I have a couple zentangle books, follow a couple zentangle blogs and use the official Zentangle website – i think it’s tanglepatterns.com or maybe zentangle.com. I think Hi-C and Umble are my favourites. Then again I also like Romancy. It’s amazing how different monotangles look compared to the multiple ones. I think I like their simplicity. It’s a lovely idea that you’re doing this blog to leave a footprint behind for your grandkids. That will be amazing for them to look through and discover a whole other side of you because you’re right as children we never think of our grandparents, or parents as having a life beyond being our parents/grandparents. Thank you, Celine. 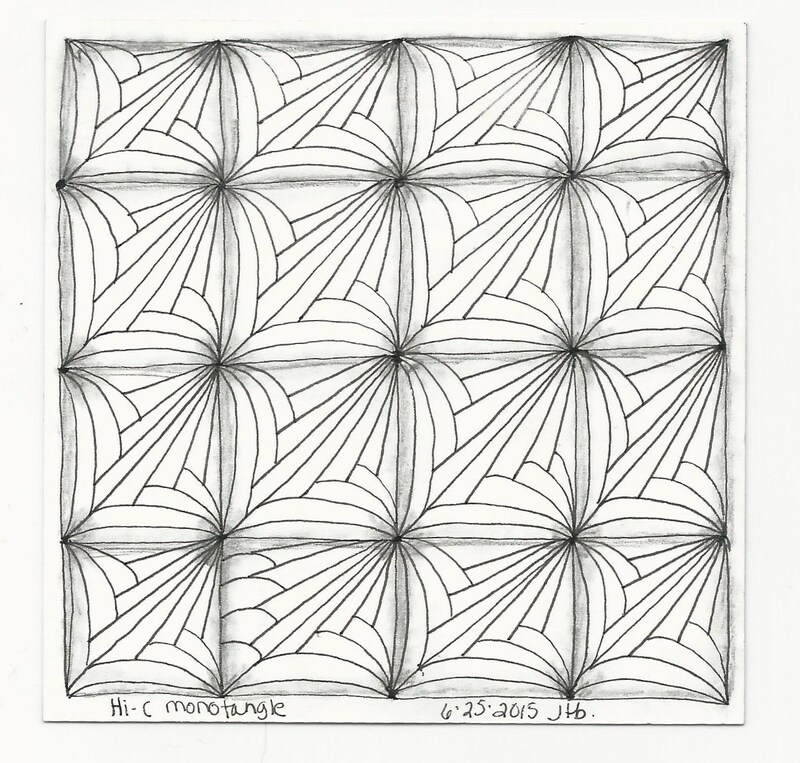 I enjoyed doing monotangles, and it’s better practice for me than working in multiples. I did find some YouTube demos (why didn’t I think to look earlier) so I’ll watch more of those. My main hindrance to improving my tangles is my eyesight but I can’t do anything about that. So I’m going to call these Challenge Tangles and be happy I can make a semblance of the patterns at all!! I love you guys. You are all so encouraging. Thank you! Oh man, these are gorgeous! I love them all, but Romancy is also my favorite. It has a lot of substance, history, and mystery to it. You are the most patient person I know. Just beautiful.